The Mental Health Continuum-Short Form (MHC-SF; Keyes 2005a) is a 14-item questionnaire designed to measure three components of positive mental health: emotional well-being (EWB), social well-being (SWB), and psychological well-being (PWB). Previous studies have proposed various models of mental health using the MHC-SF: a single-factor model, a correlated two-factor model, a correlated three-factor model (EWB, SWB, and PWB), and a bifactor model with three specific dimensions and a general factor, as well as the use of Exploratory Structural Equation Modelling (ESEM) to examine model structure. The present study assessed the suitability of multiple models using confirmatory factor analysis and ESEM in a large Canadian sample (N = 43,020), taken from the Canadian Community Health Survey (CCHS; Statistics Canada 2012a). The bifactor ESEM model had the best fit. Measurement invariance testing revealed that the bifactor ESEM model showed strict invariance across gender and ethnic minority status, and weak invariance across four age groupings. The online version of this article ( https://doi.org/10.1007/s41543-018-0007-z) contains supplementary material, which is available to authorized users. On behalf of all authors, the corresponding author states that there is no conflict of interest. For this type of study formal consent is not required. Informed consent was obtained from all individual participants included in the study. Asparouhov, T., & Muthén, B. (2010). Computing the strictly positive Satorra-Bentler chi-square test in Mplus. Mplus Web Notes, 12. Retrieved from: http://www.statmodel.com/examples/webnotes/webnote12.pdf. Gallagher, M. W., Lopez, S. J., & Preacher, K. J. (2009). The hierarchical structure of well-being. Journal of Personality, 77(4). https://doi.org/10.1111/j.1467-6494.2009.00573.x. Keyes, C. L. M. (1998). Social well-being. Social Psychology Quarterly, 61(2), 121–140. Retrieved from: http://www.jstor.org/stable/2787065. Keyes, C. L. M. (2002). The mental health continuum: From languishing to flourishing in life. Journal of Health and Social Research, 43, 207–222. Retrieved from: http://www.jstor.org/stable/3090197. Longo, Y., Jovanović, V., Sampaio, D. C. J., & Karaś, D. (2017). 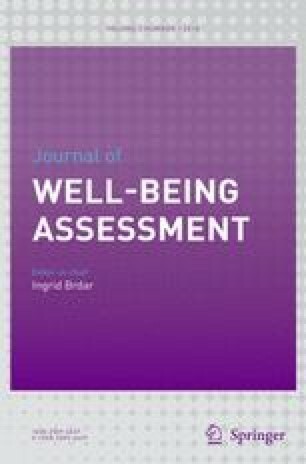 The general factor of well-being: Multinational evidence using bifactor ESEM on the mental health continuum-short form. Assessment. https://doi.org/10.1177/1073191117748394. Public Health Agency of Canada, Ministry of Health. (2014a). Economic burden of illness in Canada (Publication No. 130148). Retrieved from: http://www.phac-aspc.gc.ca/publicat/ebic-femc/2005-2008/assets/pdf/ebic-femc-2005-2008-eng.pdf. Public Health Agency of Canada, Ministry of Health. (2014b). Promoting mental health means promoting the best of ourselves. Retrieved from: http://www.phac-aspc.gc.ca/mh-sm/mhp-psm/index-eng.php. Rosseel, Y. (2012). Lavaan: An R package for structural equation modeling. Journal of Statistical Software, 48(2), 1–36. Retrieved from: http://www.jstatsoft.org/v48/i02/. RStudio (2015). RStudio: Integrated development for R (version 1.0.136) [computer software]. Boston. Retrieved from: http://www.rstudio.com/. Schutte, L., & Wissing, M. P. (2017). Clarifying the factor structure of the mental health continuum short form in three languages: A bifactor exploratory structural equation modeling approach. Society and Mental Health, 1–17. https://doi.org/10.1177/2156869317707793. Statistics Canada. (2012a). Canadian Community Health Survey, 2012 [Data File]. Available from: http://odesi1.scholarsportal.info.ezproxy.uwindsor.ca/webview/. Statistics Canada. (2012b). Canadian Community Health Survey – Annual Component (CCHS) [extraneous documents] Retrieved from: http://www23.statcan.gc.ca/imdb/p2SV.pl?Function=getSurvey&SDDS=3226.